As well as their AFV kits Bronco Models have also started to produced a fine range of artillery and anti-aircraft guns. What has been a most welcome development is that they have also started to provide crews to man these guns and this is a look at a recent release; a 6 figure set for the Bofors Anti-Aircraft gun . The set comes in a fine presentation box. On the front is a picture of the crew manning a gun along with the manufacturers details. On the reverse of the box, as is common with all their figurer releases so far, are the tree parts, build and painting instructions. A small chart of colour suggestions is also included covering common paint brands. The set itself comes in a sealed plastic bag consisting of two trees containing the parts for 3 individual plastic figures on each and a small tree containing the helmets for the set. The makeup of the figures is pretty standard; separate legs, upper torso, arms, head and additional equipment in the form of helmets and Mk 1 respirators. On 4 of the figures the hands are also supplied as separate items with the other two having the hands attached to the arms. All the figures are dressed in Battle Dress Serge 39/40 and the uniforms have the correct pocket detail and the blouses the pleated pockets. The uniforms have nice creases and folds and look quite acceptable. Five of the figures are designed to wear the Mk I respirator so the chest detail is a little suppressed to accommodate this and around the back of the blouse is the small string that was used to keep the respirator haversacks in place whilst the neck straps for same also present in reasonable detail. The heads are full heads with the chin strap of the helmet moulded on and the helmets look like Mk 1’s to me and being hollow could therefore be tilted to a desired angle. 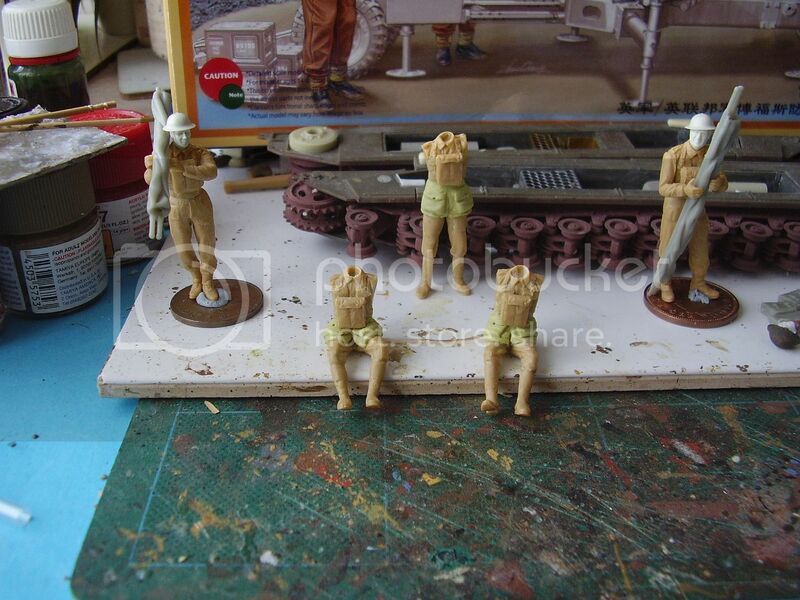 There will be the normal clean up one would expect on plastic moulded figures. Standing approximately 42/43mm heel to shoulder they are a perfectly acceptable height. The body proportions in general look quite good. Figure C has cuff detail on the arms more akin to the ends of leather gloves, so an alteration there would be necessary. Overall the level of detail is quite good, some areas like the ears and hands will need a little work as detail is quite soft . The respirator haversacks and helmets again look fine and appropriate for the early war period. Although the art work shows the figures wearing what appears to be 37 pattern web belts these are absent and in place are the blouse belt and buckle, again perfectly acceptable. No uniform decals come with the set. The figures are straightforward to build, the only tricky part is placing the hands and arms correctly, so probably build the gun first and then positioning these will be much easier, rather than a certain amount of guess work. You will need a clip of ammo from the gun to get the placement of the limbs correct. The parts will need a bit of a clean up to remove any seams and some filler around the joints. The parts all match the build instructions so there doesn’t seem to be any problem there. It may well be that I’ll need to adjust the arms slightly when I get to the gun and I had considered leaving these off until then but have added them for the purposes of the review and can adjust later if necessary. I’ve also used the kit heads, something I don’t normally do but I wanted to see how they painted up and try a straight OOB build. The faces are reasonably good for plastic but a few of the ears needed some work, and also the hands as previously mentioned. Once the filler is dry I gave the figures a good wash and a coat of primer to locate any missed seems. Odd that one always manages to miss something in the clean up! Then it is onto the fun part, the painting. It is good to see the appearance of a gun crew for the Bofors. The set has some minor issues, but over all should build into a fairly acceptable gun crew, suitable for the early war period. Some of the detail is not as sharp as one might like and they do take a bit of cleaning up. The plastic is quite soft to work with. It would have been useful if a couple of clips of ammo had been with the set, but then if you’re building the set the assumption would be you have the gun kit. I’m not sure why figure C comes without a respirator haversack and the cuff detail on the arms isn’t right, so I turned this error into a set of gloves. No decals are provided for the uniform markings which is a pity. The arrival of this set gives a wider finish option for the Bronco Bofors gun and for modellers that can only be a good thing. Both the heads and hands could be replaced should you feel that necessary. Highs: Reasonable quality, fairly easy to build. Lows: Some weak detail on the ears and hands.